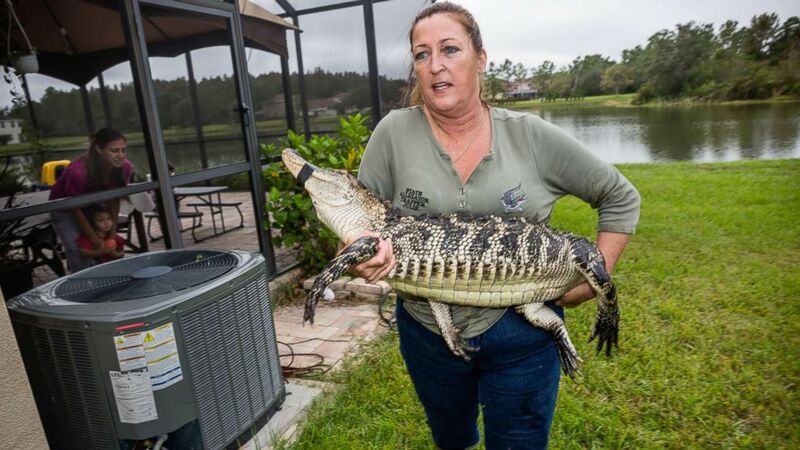 Julie Harter, 55, of Lakeland, Florida, is a teacher, grandmother to six and one of the state’s few female licensed nuisance alligator trappers. She calls herself the Lady Gator Trapper and loves her work. Julie Harter sets bait on a hook to trap an alligator. Julie Harter traps an alligator that was living in a community pond. Florida’s roughly 20 million human residents share the state with an estimated 1.3 million alligators. These animals seldom bite people, averaging only six unprovoked bites over the last 10 years, according to the Florida Fish and Wildlife Conservation Commission. Julie Harter uses binoculars to look at a trap she had set days earlier, to determine if an alligator took the bait. Still, when alligators are believed to pose a threat, people can call on the commission’s Statewide Nuisance Alligator Program, which has contracted trappers throughout the state to remove the offending animals. Harter was introduced to gator-trapping by the man she called the love of her life, Billy Harter, whom she met at a rodeo in 1994. They were married a month later, and Billy Harter, who trapped nuisance gators on the side, taught her everything he knew. A photo of Julie Harter and her husband Billy, married in 1994. Billy was killed in 2003 when a helicopter piloted by his boss who was also a good friend, crashed, hitting him while he recorded a video of the flight from the ground. “Treat every gator as if it’s your first,” she said he told her over and over. A full-time high school teacher at the time, Julie Harter also worked as her husband’s assistant, baiting and setting traps while leaving him to catch and wrangle the animals into cages. (L-R) Father and son, Jared and Robb Upthegrove, owner Glen Grizzaffe of the alligator farm Archery Shop Outfitters, and Julie Harter, release a ten-foot alligator into a pond. Julie Harter tags an alligator’s tail. One day when she was setting a trap, Julie Harter said a gator crawled out of a pond and she had no choice but to catch it and lock it up. “The gator was like 5 feet, but he felt like he was 50. It was crazy,” she told ABC News. When she showed the captured animal to Billy Harter, she said he had a newfound respect for her and from that moment on, she was no longer his assistant, but a full-fledged trapper. Julie Harter and her daughter Monica, left, at Julie’s home in Lakeland, Fla. Cooking fried alligator meat, Julie Harter prepares dinner with her family, including daughter Monica and mother Ellen, right, at her home in Lakeland, Fla.
After her husband’s death in a tragic helicopter accident in 2003, Julie Harter was so depressed she could barely get out of bed for weeks, she said. But then she was called by the Florida Fish and Wildlife Conservation Commission, which asked if she would be interested in taking over his territory. She already had a license, the trapping gear and alligator cage hitch, so she said yes and struck out on her own in January 2004. Julie Harter holds one of the baby alligators she’s raising at home while her grandson Jacob McFarland watches. Julie Harter pulls an alligator from a residential freshwater pond. Nuisance trappers working for the Florida Fish and Wildlife Conservation Commission captured more than 8,000 alligators last year. “It’s not a paid position,” Julie Harter said. “There’s no health insurance or benefits or 401(k), nothing else comes along with it. The state just gives us the opportunity to go and catch alligators legally.” Most of the gators she catches are killed and sold for their meat and hide, and about $5 per foot. Julie Harter puts a rope around a trapped alligator. While she traps at least 200 alligators per year, Julie Harter hasn’t stopped being a teacher, a job she’s been doing since graduation and one she said she loves just as much as trapping. She works at The Pepin Academy, teaching high school students with learning disabilities in Central Florida. “I take pride in [what I do],” she said. Julie Harter, grandmother, high school teacher and alligator trapper in Lakeland, Fla., hauls away an alligator she caught that had been living in a community pond. January 5, 2019 Comments Off on When is someone too high to drive?